Jim Henson’s much-loved 1982 fantasy film, The Dark Crystal, recently made headlines when an official sequel was announced, in comic book form. But the official prequel novels are already here. The first one, J.M. 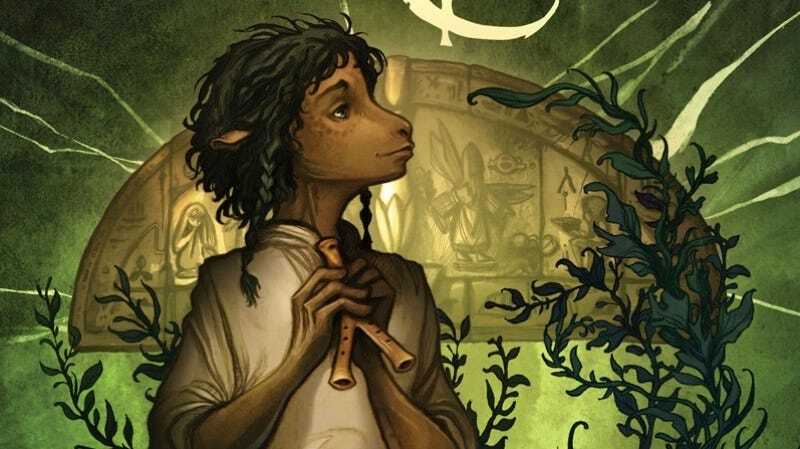 Lee’s Shadows of the Dark Crystal, came out last summer; the next in the series isn’t out until July, but we’ve got an exclusive excerpt to share. The book is called Song of the Dark Crystal, and it’s also by Lee (follow him on Twitter here). In addition to the excerpt, we also have the first look at the book’s cover art. It’s by Cory Godbey, who also did all of the book’s interior illustrations. Kylan was the second to wake, though the only evidence that he was not the first was that Tavra was nowhere to be found. Coals smoldered in the fire, but the morning was still cold and a bit damp. Kylan pulled his cloak tight and took his tablet and scroll from the traveling pack he shared with Naia. His friend and her brother shared a deep sleep nearby as Neech finished his morning preening on Naia’s shoulder. Neither Drenchen stirred as Kylan sat up and propped his tablet on his knees, spreading the scroll across it and taking time in the quiet morning to record his journey thus far. It had been several days since the last time he chronicled their journey. Dream-etching the words that described all that had happened since first arriving at the Castle of the Crystal took time. As the second Brother rose and the air began to warm he heard footsteps coming from the forest. Kylan looked up from his tablet to see Tavra emerge from the brush bearing a weighty bundle wrapped in her cloak. “You’re almost at the end of that scroll,” she remarked as she lowered the bundle of breakfast to the ground. She let the corners fall, revealing a collection of fruit, fragrant flowers, tubers and nuts. The boast seemed strange coming from a Gelfling who had kept her lineage a secret for so long. Tavra sat cross-legged and plucked a red and white blossom from the collection, picking a petal off and munching quietly on it. It was hard to believe the serious Silverling was truly one of the All-Maudra’s daughters. Kylan wondered what it was like to have siblings—he thought back on Mythra, and her tireless attempts to cheer her brother. Even Naia had Gurjin, and her sisters back in Sog. Kylan realized he was staring when Tavra met his eyes. Hers were lavender, though somewhat sunken in her weary face. The draining had certainly taken its toll on her, but despite the worn, almost deathly exhaustion, the soldier still had an ethereal, ghostly beauty. He looked away and felt his cheeks warm. It was an abrupt and peculiar thing to say, and Kylan didn’t know how to react, so he said nothing. Tavra finished the flower and tossed her hair. Naia and Gurjin woke early and the four sat around the dying fire with a breakfast of petals and pulpy fruit. They left the fruit pits and seeds in the cool ashes of the fire to sprout, packed up, and continued northeast. Tavra took the lead, always plowing ahead without looking back, left hand on the hilt of her sword while the right held a stick that she used to push brush aside as they passed. There was a path, albeit a not well traveled one, and up the trail they went. Kylan walked with Naia, who took the rear and watched Gurjin from behind. The ailing Drenchen guard was not spritely, but he had energy to his step, and the color was returning to his skin, deepening in its dappled gray-green hues. Naia, on the other hand, had paled slightly, though only enough to seem tired, which would have been understandable even if she hadn’t shared her vliya with her brother. “How are you feeling?” Kylan asked her. Kylan adjusted the pack on his shoulders. He was already sore, but he knew there was no other way to grow into it. Naia reached over her own shoulder and massaged where her wings joined her back. It seemed she was in the same situation. She laughed and Kylan laughed with her. It felt good. He had been worried about her, especially after her resolve to share her life with her brother. Instead, though her body was weakened, her heart seemed rejuvenated. That would go a long way. The highland was less dense here than below. From their vantage as they climbed, Kylan realized that they had been on a consistent ascent since they’d left the Spriton Plains so many days ago. The Dark Wood, and the Castle of the Crystal, nestled in the arms of the highlands, were lush and bountiful from the Black River that flowed down and within it. The landscape reminded Kylan of a youngling basket, a cradle–from which Olyeka-Staba, the Cradle Tree, was named, he guessed. They had not gone far when Tavra signaled for them to stop. She proceeded slowly and the others followed, Naia putting her hand on the hilt of her dagger and picking up her pace to join the Silverling at the front. Kylan stayed back with Gurjin, who stooped to pick up a hand-sized rock as a makeshift weapon. The path widened and curved to accommodate a crop of boulders, half a dozen big things that were probably the last remains of an ancient avalanche. Most remarkable about the structure, though, was the frothy white mass of cobwebs that covered it. Had Kylan not heard Tavra say spiders, he might have thought the rocks had grown fur or some kind of mold or fungus. No spiders were in sight, but the boulders had plenty of nooks and crannies for a dark sleeping space. Tavra stepped lightly, circumventing the rocks, and they followed. Kylan marveled at the webbing, despite what dangers it might hide. It shone in the early morning sun like spun silver, draped in thick tapestries inlaid with delicate patterns. They had nearly passed the formation when Kylan saw something beneath the webs. At first he thought it was a trick of the eye, but he squinted and took a careful step closer. “Leave it alone. You’ll wake them,” Tavra urged. Naia crossed her arms. Though she whispered, her voice was no less staunch. While the others argued quietly, Kylan scooted closer yet, as quietly as possible. He could almost make the other words out. He was so close! “They will not—” Tavra began, but Naia wasn’t asking. “Go!” she said, loud enough that the clicking, chirping, skittering noise from within the nest intensified. Gurjin stepped back and Tavra glared at the Drenchen girl. Then she continued up the trail. Gurjin hesitated, but Naia shooed him. “Be careful,” Gurjin said, and hurried after Tavra. Naia slipped her knife into her belt and faced the rocks with Kylan. Kylan and Naia took slow steps closer to the rocks. No matter how quiet, each step stirred the shadows within the nest. Veiled by the gauzy web, the spiders inside were almost impossible to see, though as they neared Kylan thought he could make out a rolling coat of black, shining bodies. Web-wrapped lumps hung in the draped nest, some with the feet and tails of woodland creatures sticking out. Kylan almost took it for what it was, whatever it meant, but he could see there was still more hidden beneath the web. To reveal the last part of the message, he would have to brush the web aside. He picked up a stick, glancing within the nest where some of the spiders were emerging, tiny black things crawling along the strands of the webbing. He held the stick carefully, to show he was not a threat, and to indicate to Naia what he was about to do. “You don’t have to stay,” Kylan whispered. He took the last step, close enough to reach the rock with the web. Naia stayed back, watching the nest as it slowly came to life. Kylan reached out with the stick and poked at the web near the writing. As soon as the stick touched the web, spiders emerged, in small numbers at first, and then more. The web was sticky, and thick, and he had to exert more effort than he expected to tear the netting to the side. The sounds of the nest grew louder as the larger spiders awoke, some the size of Kylan’s hand. “Hurry,” Naia said again, more urgently. Finally, the web came away. The remaining words that completed the etching were startling, and Kylan forgot about the spiders. Naia grabbed him by the pack and yanked him away, nearly picking him and the pack up in the process. Kylan took his eyes off the writing and willed his legs to move. They sprinted away from the cropping and up the trail. When they were in the clear, they stopped to catch their breath. Tavra and Gurjin’s footsteps marked the trail, and Kylan could make out their forms in the wood ahead. He panted and wiped his forehead, sweating more from shock than the physical exertion. Kylan tried to tell her two times before finally getting the words out. J.M. Lee’s Song of the Dark Crystal will be out July 18, 2017. Motherlode of Dark Crystal and Labyrinth art comes to New York!